Resist blight in an urban neighborhood by cleaning up and updating the convenience store on the corner. 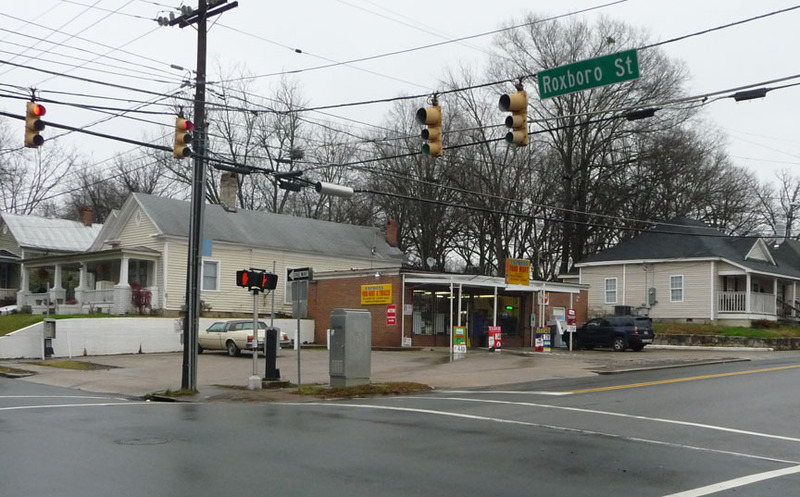 The store operator, the building's owner, a nearby CDC, the City of Durham, and local lenders teamed up to build consensus and align funding for exactly that. Over the course of 18 months grants were obtained, designs produced, construction completed, and the exterior of the store is now a story of a neighborhood turning around. We helped generate a key idea that helped motivate the project and shaped the outcome: that the neighborhood would benefit if local food principles were integrated throughout a multi-block revitalization effort. Beyond this concept, design effort stayed minimal and looked for cost-effective choices to improve the street character, increase safety, respect the residential neighbors, and present a new face to the community. We removed the derelict canopy and replaced it with a metal awning. We opened a window onto the side parking lot to get more eyes on the street. We installed privacy fencing to shield the neighbors from the visual presence of our parking lot. And finally, we reconfigured the iron bars at the front windows to fold back, removing the harsh image of crime protection, and replacing it with a gesture of welcome.